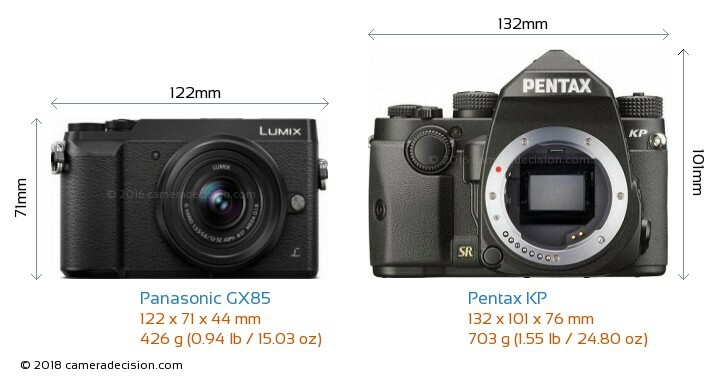 Here we are comparing two cameras with different body types: Panasonic GX85, which was introduced in April 2016 is a Semi-Pro Mirrorless camera with a 16.0MP Four Thirds sensor whereas Pentax KP, which was introduced in January 2017 is a Semi-Pro DSLR camera with a 24.0MP APS-C sensor. Let's have a brief look at the main features of Panasonic GX85 and Pentax KP before getting into our more detailed comparison. Below you can see the front view size comparison of Panasonic GX85 and Pentax KP. Panasonic GX85 is clearly the smaller of the two cameras. 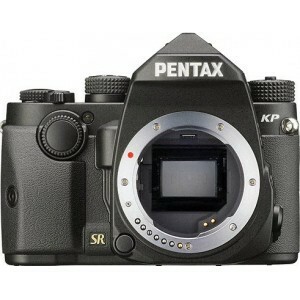 Its body is 10mm narrower, 30mm shorter and 32mm thinner than Pentax KP. Now lets look at the top view comparison of Panasonic GX85 and Pentax KP. Weight is another important factor especially when deciding on a camera that you want to carry with you all day. Panasonic GX85 is significantly lighter (277g ) than the Pentax KP which may become a big advantage especially on long walking trips. Also keep in mind that body weight is not the only deciding factor when comparing two interchangeable camera bodies, you have to also take into account the lenses that you will be using with these bodies. Since Pentax KP has an APS-C sized sensor and Panasonic GX85 has a smaller Four Thirds sensor, Panasonic GX85's lenses for a similar focal length and aperture will generally be lighter and smaller than the Pentax KP lenses. Panasonic GX85 has a 16.0MP Four Thirds (17.3 x 13 mm ) sized CMOS sensor and features Venus Engine processor. On the other hand, Pentax KP has a 24.0MP APS-C (23.5 x 15.6 mm ) sized CMOS sensor and features PRIME IV processor. Pentax KP's sensor provides 8MP more than Panasonic GX85's sensor, which gives a significant advantage in real life. You can print your images larger or crop more freely. On the other hand, please keep in mind that Max sensor resolution is not the only determinant of resolving power. Factors such as the optical elements, low pass filter, pixel size and sensor technology also affects the final resolution of the captured image. 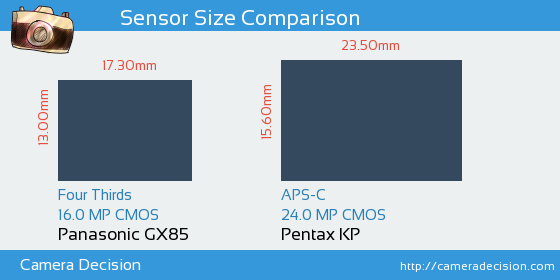 Below you can see the GX85 and KP sensor size comparison. As seen above, Pentax KP has a 1.6x Larger sensor area than Panasonic GX85. Larger sensors give photographer more control on the depth of field and blurry background compared to smaller sensor when shot in same focal length and aperture. What types of Photography are Panasonic GX85 and Pentax KP Good for? 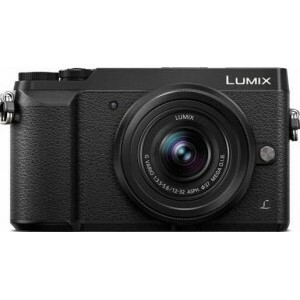 In this section, we rank and compare Panasonic GX85 and Pentax KP for five different photography types in order to make your decision process easier in case you are specifically interested in one or more of these areas. Number of available lenses is a big decision factor while choosing your interchangeable lens camera. 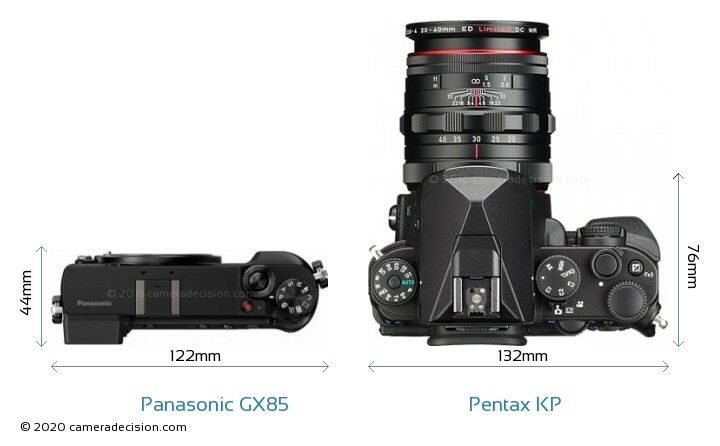 When we look at the available lenses for these two cameras, we see that Pentax KP has an advantage over Panasonic GX85 There are 148 lenses for Pentax KP's Pentax KAF2 mount, on the other hand there are only 98 lenses for Panasonic GX85's Micro Four Thirds lens mount. Another important factor is the availability of image stabilization. Both Panasonic GX85 and Pentax KP has Sensor based Image stabilization which means that all the lenses will be stabilized in these bodies. You may have already made your decision about which camera suits better for your needs and your budget so far but in case you wonder how we rated Panasonic GX85 and Pentax KP, below you can find their scores in five different aspects. Our Decision Algorithm dynamically scores cameras using 63 different specs, current price and DxO Mark scores (where possible) in order to make a more objective and consistent comparison. Panasonic GX85 has a higher Overall Score than the Pentax KP and would be our choice if we have to decide between these two cameras.